By far the most well-known family of the cwm and the oldest family recorded as living there, the Shon Joneses were for their time something of a legend. Oral history, as the following article outlines, has them living there for eight centuries and their longevity is well noted. With only the odd journey out of the cwm to market or for provisions perhaps it was their isolation in a time when life expectancy was around the 40 mark that protected them. Their water would be fresh off the mountain, naturally filtered; in a very rural area such as the parish of Ffestiniog with a population of less than 1000 before 1820 transmission of disease would be limited. The reference to the length of Jones tenancy in Cwmorthin may have originated in an early Welsh gazeteer of sorts published in 1875 called “Cymru” where the author Owen Jones relates a conversation that Sion Jones had heard his father say that his father said that the family had lived there for 800 years. The opening of four quarries in Cwmorthin led to new houses and two chapels being built there for the quarrymen, but long before the period of the quarries there stood two farmhouses here...Cwmorthin Isa (Lower Cwmorthin) and Cwmorthin Ucha (Higher Cwmorthin). Cwmorthin Isa and its small patches of land has long since disappeared under the slate waste tips, fortunately Cwmorthin Uchaf escaped this fate. It lies to the right of the valley, at the foot of Allt y Ceffylau ( the steep track of the horses) built here, more likely than not, in order to make the most of the sunshine available. It is believed that the lineage of the Shon Jones' family living at Cwmorthin goes as far back as 800 years, with the last of the Shon Jones passing away in 1863 at the grand old age of a 100. The family were renowned for members of the family living to be a hundred, the other being that the eldest son of every generation was named Shon Jones, and hence the family was always referred to as the 'Shon Jones' of Cwmorthin'. The last of the 'Shon Jonsiaid' was a tall bony man, who bore a rural appearance as well as a rural way of life. His appearance didn't concern him in the least. He was a completely illiterate man and his whole world was his farm, the fairs he attended and how to buy and sell his sheep and cattle. The 'Shon Jonsiaid' reared prime sheep and would drive them to Ruthin to be sold. This meant walking them all the way from Ffestiniog, and Ruthin became known by the locals as "Shon Jones' England". With regards to raising their sheep a reflection of their good reputation may be seen when one learns of how a member of the Tan y Bwlch family, who upon insisting that nothing but the very best young animal (llwdn) would suffice for their wedding feast, purchased his animal from the Cwmorthin Ucha farm, for three shillings and a groat. Before the slate industry came into being, those who lived in the area survived solely on what they grew or raised on the land. Very little would have been obtained for these animals. The last Shon Jones to live in the valley said that his father, who had some very good 'Speckled Hens'(Frech) about a year and half old, tried to charge the young summer shepherd boy, half a guinea for one of them. The young lad discussed this offer with his own father, who then went up to see Shon Jones and turned down the offer, it being much too expensive. Even as the last of the Shon Jones' got too old to care for his sheep, he would still visit the sheep pen when the time came for shearing. Saying "Cheap for the good, cheap for the good" on the way towards the pens, and "May God be with them, may God be with them" as he left. 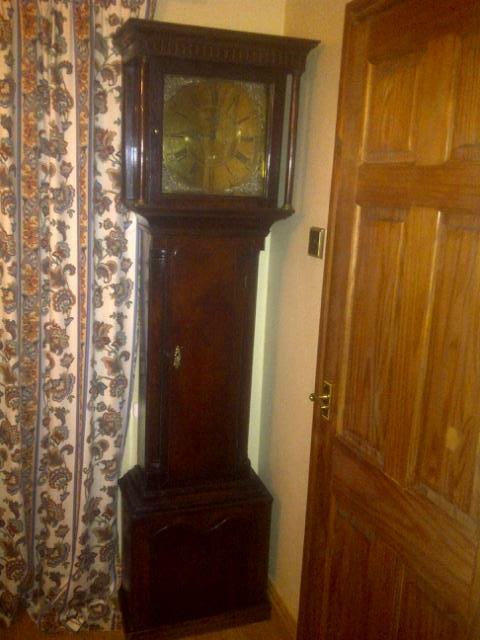 Locally it is believed that the first clock in North Wales was the one that arrived at Cwmorthin Ucha farm. Whether or not this is true, it did cause much excitement. People came from all over the local area to see this wonder. It is hard for us to imagine nowadays what this would have meant to them, we have grown so used to clocks and watches etc wherever we go. Shon Jones felt that the children had been honoured to be a part of this experience. On the day after the clock was installed in the kitchen he was asked by his son if he liked it. The reply was "Indeed I do not. This is the most noisy creature I've ever heard. It has been noisy all night long, not stopping for a single minute"! A week later the man who had installed the clock called at the farm to check that it was keeping the correct time and to wind up the mechanism. Whilst he was attending to the clock, Shon Jones asked his wife what the man was up to. "Well Shon dear, don't you understand?" the elderly lady said "It’s going to keep the time", "Oh! oh!" said Shon. "There you go Shon Jones, it's fine now, but don't be surprised when it warns you". "Warn indeed" he said "Warn who indeed. No one in this family has ever been warned in this place before! What will something like this be warning us here of I wonder?" The clockmaker reassured Shon Jones that he and his family were in no danger if the clock warned them - it was just that the clock would 'warn' them before striking the hour. Over a period of time, Shon Jones and the clock came to an understanding, although one must admit that Shon Jones never fully understood the clocks movements in its entirety but the conversation, whoever he met, would always be turned to the clock. Once he was asked what the time was, he entered his house to have a look, and the reply that came was "It isn't ", "How is that?" asked his companion.... "Well" he said "they told me that on the clock there is nothing more than twelve o'clock and nothing less than one o'clock, and both hands are between twelve and one, hence we have no time at all." Once, when Shon Jones and his brother walked over to the Llanrwst fair, there being no other means of transport in those days, Shon Jones asked a neighbour how many miles it was over to Llanrwst. "14 miles" came the reply. "Come on then Harri" said Shon Jones "Just seven miles each!". Shon Jones had another brother called Dici, who was not as sensible as most of us. When they went to the Llan Ffestiniog fair, Dici , almost without exception, would start arguing and inevitably fighting with someone, and Shon Jones would be pulled into the incident. Often they would be followed out of the village by their opponents as far as Pen y Cefn, about two miles away from their home, where those who followed them would turn back home and the trouble would have come to its end until the following year. Once when the two were walking back from the fair, past Tanygrisiau farm , their aunt : Catrin Cadwaladr, saw them and asked Dici if he had had a lot to drink, and if he'd been fighting. "Well yes" he replied " I drank as much as the largest bowl in your house, but with regards to the fight I got into, there's no danger of the law getting involved, I hit him ...but not with a closed fist"
Later on in his life Dici took to gathering knives of all kinds and sizes, and had a chest full of them when he died. He married late on in his life, but the marriage didn't last very long. His wife took up with another man and they moved away to England to live. Dici picked one of his knives and went after them in the hope of bringing his wife back and killing the man. Unfortunately for Dici he soon ran out of money and had to take on some work corn thrashing for a short while before making his way home. Upon his return home Cadwaladr Owen of Glan'r'Afon Ddu asked him how things went for him on his journey to England. "I'm embarrassed to say" came the reply " I worked with the two wooden halfs and I shan't go thrashing with it again no matter what this old world will bring me, it would come over from this side and the other and hit me on the head each time!". It's no wonder, even though it was a popular mean of threshing at this time, that Dici didn't know how to use the ffust [flails](or the two wooden halfs as he called them), as their means of threshing at Cwmorthin Ucha farm was to thresh what little oats they grew on the old potato strips next to the lake, using washing boards against their barn door. Seeing how the last of the Shon Jones' lived to be a hundred, and his father before him the same bar five years, he had up to about two hundred years of memory all told. 'That won't do 'said the gentleman, 'Go there again and tell him that he must try and get some money together for me. I want 17 shillings to go to London next week'. " Another time there were a couple of men making their way through Cwmorthin heading towards Croesor and Nanmor to the west, one of them had a letter to give to someone in Beddgelert. Shon Jones saw them and then saw one of them turning back. His companion went over to talk to Shon Jones whilst he waited for him. Shon Jones enquired as to the reason why the man, known as Huw, had turned around and gone back the other way. His response to this was "Heavens above! There is such a fuss with things like this! I remember a time when there only three people who could even do a letter in our parish - Hwmffra Bwmffra, from Glan y Pwll , someone over at Plas Meini, and William Dafis, John Dafis' son, from Cae'r Blaidd." The Shon Jonsiaid' of Cwmorthin came to the end of their lineage when the last Shon Jones died in 1863. The valley lost its King, and this was how Shon Jones saw himself. Quarry men lived here for a while before they all moved away and Cwmorthin Ucha was left to become a ruin along with the quarry buildings. Evan Jones was an entirely self-made man. Born in 1867, he began his career aged fourteen as a slatemaker at Maenofferen quarry. In 1889 he became a rockman and in 1897 worked at Groesyddwyafon quarry to the east of Ffestiniog where he had training under John Strick CB. Jones attended night school under the auspices of a Mr Johnson of the Oakley quarry and was taught Geology by John Griffiths later of Dolgellau County School. As agent he was enterprising and energetic, and was defeated not by any shortcomings of Rhosydd or of himself, but by economic facts. After Rhosydd closed he returned to Groes. But he had other interests too. During the First War, with the rank of captain, he commanded a Welsh Miners Tunnelling Company in France - believed to be the 183rd Tunnelling Company in which there could well have been other Ffestiniog slate miners. He was twice mentioned in dispatches but details of the two incidents have yet to come to light. Sir Evan had married Anne Roberts in 1898 and on the 26th of October 1900 a son – David Morris Jones – was born. Tragically, Anne died on the 18th November believed to be due to complications during childbirth. She was only 30 years old. At this time they were living in Station Road, Ffestiniog a short travelling distance from Groes quarry and David was cared for by Anne’s sister Ellen. Sir Evan married Ellen and Anne’s sister Mary in July 1905 shortly before moving to Cwmorthin. She was with child when they moved and daughter Ellen Anne Jones was born in February 1907. They continued to live in the Plas until 1931 when they left due to the poor health of his daughter Ellen Anne. Ellen died in July 1934 at the young age of 27. "I was fifteen when my great Uncle Evan died in 1949, so my memories of him are those of a child. He and great Aunt Mary came to visit us regularly at Tan-y- Ffordd - in the house where I was born in Rhoslan, a small hamlet a mile out of Tudweilog. “They came in a chauffer driven car, which impressed me greatly. There were few cars in Tudweiliog then. The chauffer's name was Mr Jones. “Uncle Evan always smiled as he came but Auntie Mary always looked rather severe. I realised years later that she was probably already suffering from Parkinson’s disease. She was a very beautiful woman, tall with a mass of white hair and large brown eyes. “Uncle Evan never seemed to alter apart from putting on a bit of weight. I think he must have been very handsome as a young man. There was a picture of him in Bryn Meirion, dressed in his army Captain's uniform. After he and Auntie Mary had died the picture hung in Auntie Nell's house- Auntie Nell being Auntie Mary's youngest sister. “A couple of times a year my mother and 1 used to go and stay with her sister Jenny (Griffiths) who lived at Tanygrisiau. “We always went to visit Auntie Mary, Uncle Evan and Auntie Nell. Then we would go and see ‘Dei Mor’ (Syr Evan's son by his first wife, Ann) and Auntie Bessie in Arael (Llan Ffestiniog). “The next question was usually 'Have you learnt your verses for next Sunday?' After that I would have to recite them to her. Uncle Evan would ask what books I had read recently. “I have always loved books and don't remember learning to read. He was very kind and every so often used to send me books, which I much appreciated. Once he took me to the library and said to have a look at the books and to take any I liked. I chose a couple, which I still have. “He would come and stay with us in Tan y Ffordd in the summer. Auntie Nell would look after Auntie Mary at those times. I imagine he needed a break sometimes. “In August 1943 my family moved from the Lleyn Peninsula to Liverpool but my mother and I still visited Tanygrisiau every so often and to Llan Ffestiniog of course. Sir Evan was active in local politics: at various times chairman of the Ffestiniog UDC and of the County Council, Sheriff of the county, Deputy Lieutenant, JP; and it was for this work that he was knighted in 1935. He died aged 81 in June 1949. Lady Mary died in March 1953 aged 84. In the Cwmorthin Quarry estate Rent books for 1902 we have John Phillips listed as the householder for Cwmorthin Isaf , although there are reasons to believe that the actual abode was Cwmorthin House (Plas Llyn). The 1901 census shows a David Jones listed as living in a dwelling called “Cwmorthin” which in the 1902 rent books is clarified as being Cwmorthin House. Neither person is mentioned in the rent books until 1910 when John Phillips is renting Cwmorthin House. John Phillips was born in Bala on the 26th September 1852 and married Elizabeth Owen of Muriau Bychan, Trawsfynydd in June 1875. He became a quarry manager at Cwmorthin Quarry in early 1902 and lived in the valley until his death in 1910. Their first child William was still born in 1876 whilst the family were living in Muriau Bychan, and Margaret Jane died of measles aged about eight months, according to her gravestone and the burial records at St. Madryn church, Trawsfynydd, in 1886. The photo above (courtesy of Keith Phillips) shows the Phillips family standing at the doorway of Cwmorthin House. They are – John Phillips, Elizabeth Phillips, Annie Phillips and John Phillips (Jr) at the back with Jane Winifred Phillips to the left of her father John Sr. with Robert and Tudor sat on the front step. One of the brothers was killed during service in the Great War. Azariah (pictured right) was a Lieutenant in the Royal Flying Corps and died as a result of an accident in a BE2 aircraft at Old Sarum airfield near Salisbury on the 11th of January 1918. He was an instructor at the base and the trainee pilot failed to avoid a W/t mast whilst making his approach to land. Corporal Robert Edward Phillips of the 2 Btn Royal Welch Fusiliers died whilst in Limerick during the Irish War of Independence on the 24th of June 1919. William died in Aston, Birmingham on 22nd November 1918 with his brother John at his side. He died of influenza and double pneumonia as a result of the Spanish flu outbreak in 1918 which killed over six million people across Europe.